The report displays a list of contributors along with the number of articles they have posted in the knowledge base. A contributor can be a Superuser, an Editor, a Writer, or a Writer-trusted. Expand "Statistics" section in left navigation bar and click on "Users" link. Users statistics page will display; click on "Contributors" tab to view the details of contributors and their contributions. The X-axis of the graph represents serial IDs of the authors in the knowledge base. 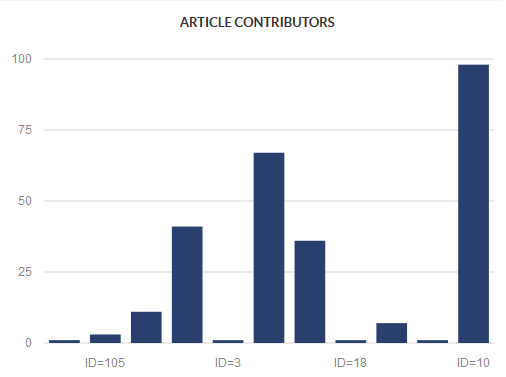 The Y-axis of the graph represents a total number of articles posted by these users in the knowledge base. When you place the mouse pointer on any of the bars, it will display serial ID and the count of articles posted by the user. ID: This column displays the serial ID of the user in the knowledge base. Name: This column displays the full name of the user along with the username in brackets. You can click on the name to view user details and all its contributions. 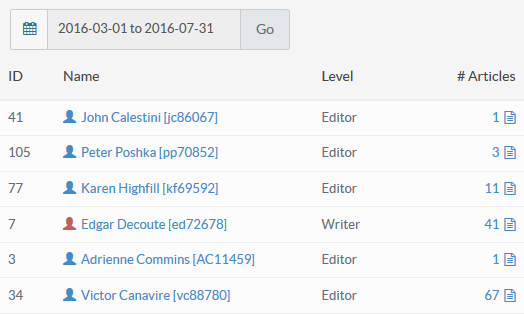 Level: This column displays the level of the user in the knowledge base. # Articles: This column displays the number of articles posted by users in the knowledge base. You can click on the number to view the details of articles posted by the user.